← Gemvara keeps on flourishing! If in 1999, investors weren’t convinced that shoppers would buy a diamond ring online, the gleam is certainly in their eye today. eCommerce has been one of the most active segments, with 67 merger and acquisition transactions topping $6 billion thus far in 2011 vs. $180 million in the same period in 2010 according to investment bank Petsky & Prunier. Within eCommerce, one of the segments which is gaining traction and investment favor is jewelry. Since late 2010, Gemvara, Stella & Dot, Baunat and BeachMint have all secured major funding rounds ranging from $4 to $40 million. And jewelry is an active segment in the fast-growing fashion flash sale business which includes such heavily funded websites as the Gilt Groupe, which recently raised $138 million, Beyond the Rack, Hautelook, Ideeli, Modnique, Rue La La, and My Habit. Increased Shopper Confidence: Twelve years ago, investors were skeptical if shoppers would flock online to buy big ticket items. But the growth of eCommerce since the late 1990s has proven that consumers will buy anything online which they used to buy in-person. Through mechanisms like merchant reviews and based on an overwhelmingly positive shopping experience, shoppers, who first dipped their toes into online commerce with the purchase of a book or a T-shirt are now willing to place their trust in online merchants in the same way they trust a local shopkeeper. Customization: A big benefit for online jewelry retailers versus local jewelers is the ability to create customized jewelry based on shopper requests. With most local jewelers buying directly from a few wholesalers, they usually don’t have the design and manufacturing contacts to create and manufacture customized jewelry. Furthermore, a one or two store operation usually lacks the scale in order to make such an operation profitable, and the wholesalers who supply their jewelry are focused on selling existing (and not customized) jewelry through their pipeline. For an online jeweler, customization can be a point of differentiation around which the company was developed. And in the same way that local jewelers historically built their business by knowing the tastes of their local clientele, online jewelers have established their businesses based on the ability to source jewelry from a broad range of international suppliers to improve cost efficiencies and create product differentiation. Product Selection: As with customization, product selection is another area where local jewelers face challenges when competing with online jewelers. All an online jeweler needs to do to add a new product is to upload a picture and description of the product. A local jeweler, on the other hand, must physically obtain the product and then merchandise it in-store. The ease in which new products can be added and removed enable online retailers to add and then tweak entire product lines with ease, facilitating much more fluid merchandising opportunities. This issue is magnified when it comes to loose diamonds. 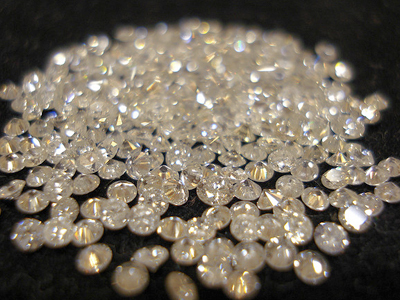 Online stores can hold a virtual list of diamonds, thus enabling them to exhibit tens of thousands of loose diamonds for sale. Needless to say that no brick and mortar store can hold such inventory. Improved Product Displays: In 1999, most online shoppers accessed the Internet through a dial up modem. Today, with almost all shoppers using broadband Internet,and advancements in 3D imaging and graphic displays, shoppers can really see how the ring or necklace will look. Better Customer Service: One of the reasons for the improved shopper confidence is undoubtedly the improved customer service. In 1999, most shoppers had to log off an eCommerce website and their dial-up Internet service in order to free up their phone line to make the phone call to call customer service, if the website even published a number to call. Today, most online retailers offer shoppers a range of options, including real-time chat, FAQs and toll free numbers to customer service, all available 24/7, and often in several languages. Along with these pre-shopping services, online shoppers also benefit from free shipping from many online retailers on many items, and very liberal return policies. Though social and mobile shopping applications are also helping all online retailers, including jewelers, it’s the aforementioned improvements in online retailing which are driving the newfound interest and investment in online jewelry companies. Yes, Ms. Monroe certainly had it right, but watch out girls, diamonds just may be an investor’s new best friend. This entry was posted in Diamonds, Innovation, Jewelry Industry, Jewels and tagged Gemvara, VC_money_jewelry. Bookmark the permalink.